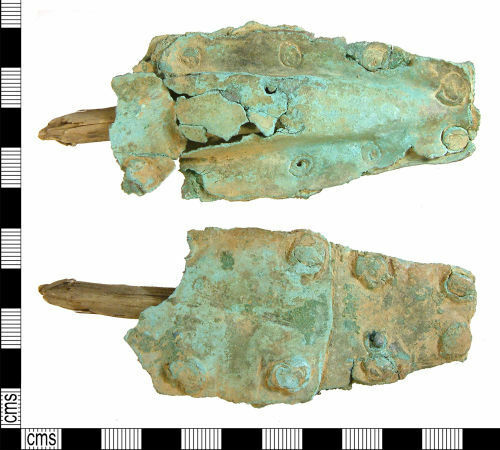 An incomplete Early Post-Medieval (c.1550-1700) sheet copper alloy handle attachment plate from a skimmer (or similar) with part of the original wooden core surviving. Part of the handle length is missing, as is the pierced skimming plate to which it would have attached. It survives in three pieces - the wooden core and attachment plate, of which a small piece is loose. It measures 100.22x40.44x(max)9.09mm and weighs 32.03g. The handle attachment itself comprises three separate pieces of sheet copper alloy. Two run the entire length of the surviving piece, one front and one back, while the third is attached to the back and occupies half its length. Possibly this is the remains of the straining (or other) plate, or perhaps it is the other end of the handle and for strengthening it or to repair damage. It ends at the break. To the front the handle is also flat but with a raised rectangular section at the centre, 18.82mm wide at the break and narrowing to a point just before the other (complete) end. The rivets are arranged around the edges of the attachment plate, four on each side. Two occur at the widest point, just before the break (40.44mm wide), two at the opposite narrowest end (23.55mm wide), the other four arranged equidistantly and ia paris between. To the flat underside are the squashed and pointed ends of the rivets, their heads being on the front of the plate. The rivets are the spiral-coned type (made from sheet copper alloy) and date from the late 16th century into the 17th century, although it is not certain how long they remained in use. Skimmers were used for removing meat and other items from the cooking pots. Cf. Egan 1998, p.156-7 no.438.